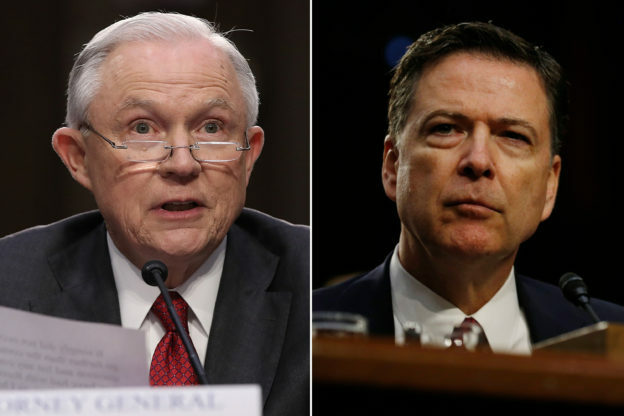 Neither phrase was actually blasted from a loudspeaker on either June 8, when ex-FBI director James Comey testified before the Senate Intelligence Committee, or last Wednesday, the 13th, when it was Attorney General Jeff Session’s turn to answer questions. But, predictably, the reactions to the two men’s sworn responses to committee members’ questions came flying as fast and furious as any race car or boxer’s hook. Mr. Comey, who served in the Department of Justice before being appointed to head the FBI in 2013, has the distinction of having drawn harsh criticism over the past year from both sides of the political aisle. Last summer, Republicans condemned him when he told the media that he would not recommend that Hillary Clinton be prosecuted for using a private email server as secretary of state. Democrats, for their part, castigated him for his pointed criticism of Mrs. Clinton’s actions. Then, when Mr. Comey announced mere weeks before the election that the FBI was reopening the investigation of Mrs. Clinton, her supporters were further outraged. Being blasted by both sides in a dispute is often a sign that one is doing things right. Mr. Comey is clearly not beholden to any party, only to what he sees as his duty as a public servant. That image was only enhanced, at least for me, by his Senate testimony, much of which focused on his impression that, in a private meeting with Mr. Trump on February 14, the president had subtly tried to pressure him to drop the investigation of Michael Flynn, Mr. Trump’s erstwhile national security advisor. “It doesn’t make a lot of sense to me,” Mr. Comey replied, “but I’m hopelessly biased given that I was the one fired.” That admission, to me, reflects a self-awareness all too rare in government today. The partisan pugilists, though, took it as an admission that undermined Mr. Comey’s entire testimony. They also focused on Mr. Comey’s having shared with the media a memo to himself about his uncomfortable meeting with the president, written right afterward and intended to preserve his immediate impressions. The attorney general, too, was seized upon by the partisan pack, mainly for what it characterized as “stonewalling” – his declining to respond to questions about private conversations he had with the president. But, as Mr. Sessions explained, since Mr. Trump is protected by executive privilege, he, Mr. Sessions, did not feel he could relate information that the president might not wish to become public. Many of us might relish the thought of hearing about those conversations, but the attorney general’s point is entirely defensible. The only conflict between Mr. Comey’s and Mr. Sessions’ testimonies lay in their description of what transpired on February 14, when Mr. Comey emerged from his private meeting with the president and expressed to the attorney general that he, Mr. Comey, felt that such a one-on-one meeting was improper. Mr. Sessions, for his part, testified that he did in fact respond to Mr. Comey’s expressed discomfort, and that he agreed with him on the importance of maintaining proper protocol. As explosive contradictions of testimony go, this was more a fizzled-out sparkler than a bombshell. The discrepancy between the “body language” of Mr. Comey’s recollection (especially qualified by his admission that his memory of the moment is unclear) and the short response of Mr. Session’s remembrance is hardly the stuff of perjury. And so, what the two testimonies leave me with is a favorable impression of two upstanding public servants responding as best as they feel they can to Congressional questions. Pundits are expected to take sides here, to find some fault in Mr. Comey or Mr. Sessions. But I don’t see any glaring ones. I’m left only with a positive impression of two honorable men. This entry was posted in Journalism, News, Personalities on June 22, 2017 by Rabbi Avi Shafran.